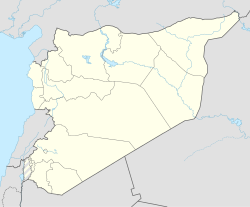 Al-Sanamayn (Arabic: الصنمين‎, also spelled Sanamein, Sanamain, Sunamein) is a city in southern Syria, administratively part of the Daraa Governorate and the center of al-Sanamayn District. It is located 55 kilometres (34 miles) north of Daraa and 50 kilometres (31 miles) south of Damascus. Nearby localities include Kafr Shams to the northwest, Deir al-Bukht to the north, Jabab to the northeast, Bassir to the east, Tubna to the southeast, Inkhil to the southwest and Qayta to the west. According to the Syria Central Bureau of Statistics (CBS), al-Sanamayn had a population of 26,268 in the 2004 census. In addition to being capital of the al-Sanamayn District, the city is also the administrative center and second largest locality of the al-Sanamayn nahiyah ("subdistrict") which consists of 16 localities with a collective population of 113,316 in 2004. The city's inhabitants are predominantly Sunni Muslims. Al-Sanamayn has an altitude of 640 metres (2,100 feet). The name al-Sanamayn is Arabic for "the Two Idols." It has been identified with the Roman-era village of Aere, a station mentioned in the Antonine Itinerary on the road between Damascus to the north and Nawa to the south. A temple in al-Sanamayn dedicated to Tyche, the Greek goddess of fortune, has been dated to 191 CE. Another was apparently dedicated to Tyche's Roman equivalent, Fortuna, who was central to Bosra's state cult; it dates from the early to mid-3rd-century CE, during the reign of emperor Septimius Severus. A Batanean inscription from the reign of Roman emperor Julian the Apostate in the mid to late 4th-century was discovered in al-Sanamayn. Al-Sanamayn had its own governor under Ikhshidid rule (939–969) until 945 when the Banu Uqayl was entrusted with governing the Hauran region. A peace treaty between the Baldwin I, the Crusader king of Jerusalem, and Toghtekin, the Muslim ruler of Damascus was signed at al-Sanamayn in 1111. The treaty was signed after a Crusader army pursuing Muslim forces to the Lejah was taken by surprise and surrounded at al-Sanamayn. In December 1168 a Zengid army was assembled at al-Sanamayn to launch an expedition towards Egypt to check the suspected independent ambitions of the Fatimid vizier Shirkuh, who was originally dispatched to Egypt by the Zengids to stave off a Crusader invasion. Zengid sultan Nur al-Din awarded each soldier 20 dinars before they departed. The place was visited by medieval Syrian geographer Yaqut al-Hamawi in the 1220s during Ayyubid rule, and noted it was "a town in the Hauran, 2 marches from Damascus." From the Middle Ages to the present day, the temple dedicated to Tyche was used as a mosque. Today it is also one of the best preserved Roman edifices in Syria. As in other towns on the Hajj (Muslim pilgrimage to Mecca) caravan route, the Ottoman sultan Selim I constructed a fortress in al-Sanamayn sometime between 1516 and 1520. Local janissaries were garrisoned at the fortress in al-Sanamayn in contrast to nearby Muzayrib, which was manned by imperial troops. In 1596 the town appeared in the Ottoman tax registers as Sanamayn and was part of the nahiya (subdistrict) of Bani Kilab in the qadaa (district) of Hauran. It had an entirely Muslim population consisting of 80 households and 37 bachelors. Taxes were paid on wheat, barley, summer crops, goats and beehives, and a water mill. In 1672, the village contained a congregational mosque with a minaret, two small mosques, a large khan (caravanserai) and hammam (bathhouse), but had no market. The Turkish traveler Evliya Celebi noted that some prostitutes sought work by the roadside in al-Sanamayn. In the mid-19th-century, explorer Josias Leslie Porter, noted that the ruins of a few temples were present and that the most "striking building" was a Corinthian-style, ornamented limestone temple that had since been converted to a Christian church. In addition he noted "there are the remains of several large and beautiful buildings, and some of the houses are in the best style of Hauran architecture." Among the features of these structures were large walls, stone doors, roofs and window shutters and basalt character. During roughly the same time period it was reported by the Royal Geographical Society that al-Sanamayn was an entirely Muslim village with about 60 houses and with an entrance marked by large basalt blocks. It belonged to a Turkoman family known as Kawwas-oghlu who maintained encampments between the town and Khan Dannun to the north. Al-Sanamayn was "well supplied with water," contained several bird species and its pools were filled with leeches which would be collected and sold in the markets of Damascus. In 1898 the Baedeker Palestine and Syria: Handbook for travellers noted it as "an excellent example of a Hauran village." Towards the end of World War II the Free French forces maintained a headquarters at al-Sanamayn. Syria was ruled by the French Mandate at the time. Al-Sanamayn was among the first cities to stage mass demonstrations against the government of Bashar al-Assad on 18 March 2011, joining other Hauran cities like Daraa, Inkhil, Jasim and Da'el. According to opposition activists security forces did not fire on demonstrators that day. On 25 March, however, 20 protesters were shot and killed by government forces after burning down a statue of late president Hafez al-Assad, the current president's father. An opposition activist in Damascus claimed that several protesters -as high as 20 according to some witnesses- were killed while attempting to march towards Daraa in a show of solidarity before being attacked by security forces, although that claim could not be confirmed. A government official claimed an armed group assaulted the Syrian Army headquarters in al-Sanamayn. Al-Sanamayn is base to the 9th division’s 15th Brigade On 18 September, and according to activists, an eleven-year boy was allegedly killed after being shot in the head by security forces during a boycott protest by students in al-Sanamayn on the first day of the 2011-2012 school year. On 11 April 2013, the town was recaptured by the Syrian Army. Al-Sanamayn has a cold semi-arid climate (Köppen climate classification: BSk). Rainfall is higher in winter than in summer. The average annual temperature in Al-Sanamayn is 17.1 °C (62.8 °F). About 278 mm (10.94 in) of precipitation falls annually. ^ Sanamayn Map. Mapcarta. Map depicts al-Sanamayn and nearby localities. ^ Yassin-Kassab, Robin. After all this bloodshed, there is no going back for Syria. The Guardian. 2011-06-16. ^ Amabe, Fukuzo (2016). Urban Autonomy in Medieval Islam: Damascus, Aleppo, Cordoba, Toledo, Valencia and Tunis. Leiden: Brill. p. 31. ^ Shatzmiller, 1993, p. 204. ^ le Strange, 1890, pp. 530-531. ^ Michie, 1942, p. 82. ^ Sterling, Joe. Daraa: The spark that lit the Syrian flame. CNN. 2012-03-01. ^ Protests in Syria: Road to Damascus. The Economist. 2011-03-26. ^ Troops open fire as protests explode across Syria. USA Today. Originally published by Associated Press. 2011-03-25. ^ Holliday, Joseph (March 2013). "The Assad Regime: From Counterinsurgency To Civil War" (PDF). Institute for the Study of War. ^ Child shot dead in Syria protests. UPI. United Press International, Inc. 2011-09-18. ^ Bassem Mroue (11 April 2013). "Syrian troops launch counterattack on south". Associated Press. Archived from the original on 15 May 2013. Retrieved 9 June 2013. Burns, Ross (2005). Damascus: A History. London: Routledge. ISBN 0-415-27105-3. Butcher, Kevin (2003). Roman Syria and the Near East. Getty Publications. ISBN 0892367156. Hütteroth, Wolf-Dieter; Abdulfattah, Kamal (1977). Historical Geography of Palestine, Transjordan and Southern Syria in the Late 16th Century. Erlanger Geographische Arbeiten, Sonderband 5. Erlangen, Germany: Vorstand der Fränkischen Geographischen Gesellschaft. ISBN 3-920405-41-2. Gibb, H.A.R. (2003). The Damascus Chronicle of the Crusades: Extracted and Translated from the Chronicle of Ibn Al-Qalanisi. Courier Dover Publications. ISBN 0486425193. Le Strange, G. (1890). Palestine Under the Moslems: A Description of Syria and the Holy Land from A.D. 650 to 1500. Committee of the Palestine Exploration Fund. Michie, Allan Andrew (1942). Retreat to Victory. Alliance Book Corporation. Nelles Guide (1999). Syria and Lebanon. Hunter Publishing, Inc. ISBN 3886181057. Newbold, Captain (1846). "On the site of Ashtaroth". The Journal of the Royal Geographical Society: JRGS. Murray. 16: 331–338. Peters, F. E. (1994). The Hajj: The Muslim Pilgrimage to Mecca and the Holy Places. Princeton University Press. ISBN 069102619X. Petersen, Andrew (2012). "8: The Hajj Route in Syria". The Medieval and Ottoman Hajj Route in Jordan: An Archaeological and Historical Study. Council for British Research in the Levant. ISBN 1842175025. Porter, J.L. (1858). A Handbook for Travellers in Syria and Palestine. 1. Murray. Sartre, M. (2005). The Middle East Under Rome. Harvard University Press. ISBN 0674016831. Shatzmiller, Maya (1993). Crusaders and Muslims in Twelfth-century Syria. BRILL. ISBN 9004097775. Burns, Ross. Pictures of the Roman temple in al-Sanamayn. Monuments of Syria. 2011-12-06. This page was last edited on 23 February 2019, at 10:31 (UTC).